Trusting your doctor goes a long way. The rapid penetration of managed care into the health care market raises concern for many patients, practitioners, and scholars about the effects that different financial and organizational features might have on the doctor–patient relationship. Observation Baltimore recently surveyed 1,964 residents of the Baltimore Metropolitan Statistical Area (MSA). 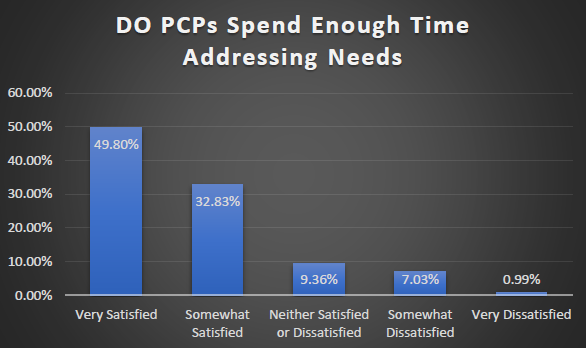 The survey focused on respondent satisfaction regarding the doctor-patient relationship; specifically, the patient’s relationship with their primary care doctor. The doctor–patient relationship has been and remains a keystone of care: it is the medium in which data are gathered, diagnoses and plans are made, compliance is accomplished, and healing, patient activation, and support are provided. To managed care organizations, its importance rests also on market savvy: satisfaction with the doctor–patient relationship is a critical factor in people’s decisions to join and stay with a specific organization. Communication and understanding is key in any healthy and productive relationship so we asked “How well does your primary care doctor typically answer your questions?” Thirty-six percent (36%) of respondents indicated their primary care doctor answers their questions “extremely well,” 41% “very well,” 20% “somewhat well,” and 3% “not so well or not at all.” Among these respondents who have a primary care doctor, 95% say they feel like their doctor shows respect for what they have to say during visits. Increasing data suggest that patients activated in the medical encounter to ask questions and to participate in their care do better biologically, in quality of life, and have higher satisfaction. A patient who does not trust or like the practitioner will not disclose complete information efficiently. A patient who is anxious will not comprehend information clearly. The relationship therefore directly determines the quality and completeness of information elicited and understood. It is the major influence on practitioner and patient satisfaction and thereby contributes to practice maintenance and prevention of practitioner burnout and turnover. This entry was posted on Wednesday, October 4th, 2017 at 1:34 pm. Both comments and pings are currently closed.